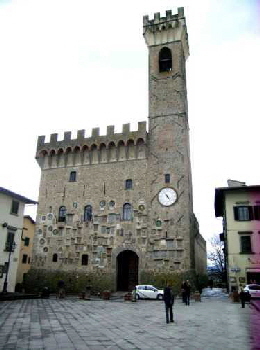 The castle of Scarperia is an example of medieval Italian architecture. It is located in the small town of Scarperia, which is the closest community to our villa. It is a comfortable distance for walking or biking from the villa. Otherwise, it is about 10 minutes drive. 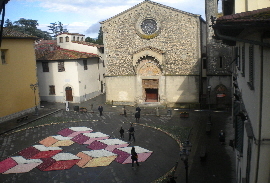 Scarperia is a beautiful medieval town situated in the Mugello valley at the foot of the Appennines. This valley is the home of the Medici family; the artists Giotto and Beato Angelico were born here. The town of Scarperia was founded in 1306 by the Florentine Republic to control the only access of communication between Florence and Bologna until the 18th century. Palazzo Vicari was built as a fortress with the surrounding walls of the town in 1415. It resembles Palazzo della Signoria in Florence. 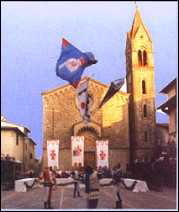 There is a major festival held in Scarperia the first week of September each year. It includes costumes and very colorful re-enactment of life during medieval times. Residents from the entire area participate. 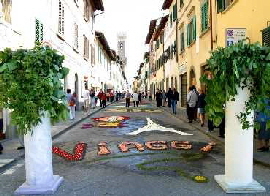 Scarperia is renowned for it's fine cuttlery, the Ferrari race track, and for it's various folkloristic festivities. in the heart of Tuscany.